Above: Catherine Kearney accepting the award on behalf of Sunnyfield CEO, Caroline Cuddihy. 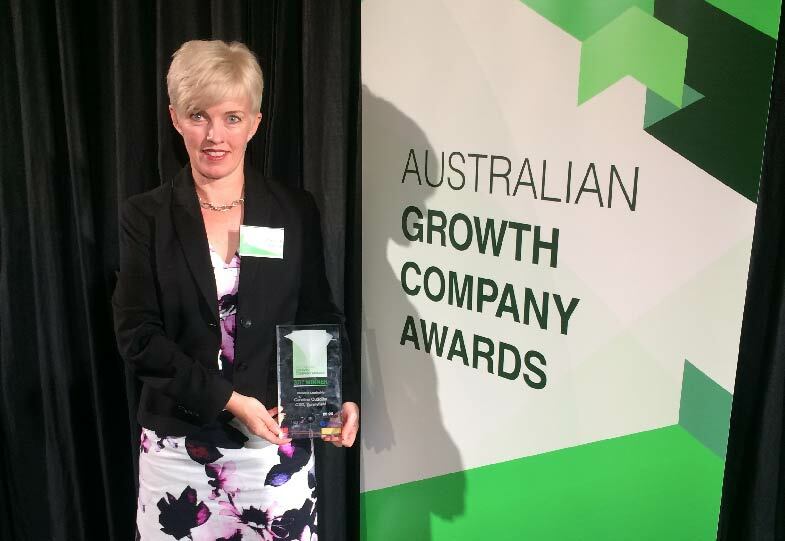 Sunnyfield’s CEO, Caroline Cuddihy was announced the winner of the “Women in Leadership” category at the 2017 Australian Growth Company Awards in Sydney on Wednesday 26 October. “I am truly grateful for this endorsement. It shines a light on the extraordinary passionate Sunnyfield team that surrounds me and their tireless collective effort to ensure people with disability are afforded every opportunity to live a fulfilling life of their choosing – this is what has made Sunnyfield the success it is today”, said Caroline. Sunnyfield was founded in 1952 by visionary parents, with a courageous spirit and strong devotion to ensuring people with disability could learn, make friends, have fun and access the support they needed to live a fulfilling life. Sunnyfield is a place many people with disability and Sunnyfield staff proudly call their place of work, their home and their community. It is Caroline’s belief in and championing of Sunnyfield’s vision, mission and values that has taken Sunnyfield from strength to strength and able to prosper in the rapidly changing disability sector with the unprecedented transition to the National Disability Insurance Scheme. This vision and passion has also been instrumental in the growth of Sunnyfield’s geographic service reach, revenue and net assets. For seven years in the role of CEO, Caroline has demonstrated strong leadership through her focus on respecting and delivering client choice, her passion to improve the lives of people with disability, families and carers, and determination to create a collegiate team culture at Sunnyfield. Caroline’s role as a Woman in Leadership reflects the aspirations and passion set by Sunnyfield’s founders, including that women should have equal and integral roles in society, as professionals, businesswomen, partners in raising the next generation, and creating an inclusive and civil society for all. Sunnyfield was also a finalist in the “Health and Life Science Growth” category which recognises extensive organisational growth – opening of new facilities, increase in employees, community contribution, sales volumes, innovation and technology, and above all, customer satisfaction. Today, Sunnyfield proudly delivers over 2000 support services for people with disability, including young children, teenagers, adults and seniors. Sunnyfield employs over 1300 staff from 65 locations across NSW and the ACT, providing accommodation services, assistance with daily life, social and community participation, supported employment, clinical services and support co-ordination. The Australian Growth Company Awards were established in 2012 and celebrate companies that demonstrate high rates of growth, innovation, integrity, contribution to community and sustainable growth. The awards program has grown into the most pre-eminent awards for Australia’s mid-market business and innovators, and is sponsored by Global X, K&L Gates, Macquarie Bank, Deloitte, 20/20 exchange, AVCAL and IntraLinks.